Our Omaha decks are built with quality and craftsmanship that hold-up to long-term wear and tear. When our Omaha custom deck team designs and builds a deck, we anticipate that it will be enjoyed and loved – which is why we use the best in low-maintenance decking. With its low-maintenance needs and its ability to stand against time, the value is hard to beat. Our custom deck Omaha professionals specialize in low-maintenance decks, which allows for more enjoyment and less work on the part of homeowners. Our low-maintenance decking means no splinters or cracked boards – not to mention it’s an environmentally responsible choice. And though wood-alternative technologies are a viable option, our Omaha custom deck professionals also offer mixed-decks – a combination of cedar and low-maintenance material – for a long-lasting, durable and beautiful choice. 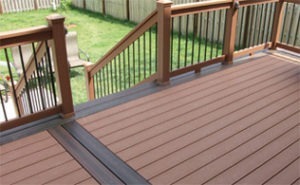 Our deck building company is the highest rated low-maintenance custom deck company in the Omaha area. Our free consultations and 3D renderings will clearly show you what a custom deck would look like on your Omaha home. Add beauty, enjoyment and value to your home with a custom low-maintenance deck. This entry was posted in Custom Decks Omaha and tagged custom decks omaha, deck building omaha, decks omaha on September 16, 2016 by Decks, Decks and More Decks.